The marsh at Stillwater Wildlife area in Western Washington. A flash of reddish-orange zipped by and dashed into the bushes at the trail’s edge. A dozen birders had come to Stillwater Wildlife Area on a beautiful early May morning. Red-winged Blackbirds, Marsh Wrens, and Black-capped Chickadees sang all around, but our concentration was on this flitting glimpse. The motionless bird stared across the marsh; it then looked one way and the other, totally ignoring our goggling eyes. Quickly, two spotting scopes focused on the male who was searching for possible intruders. “That’s my first Rufous of the year,” Gordie said. 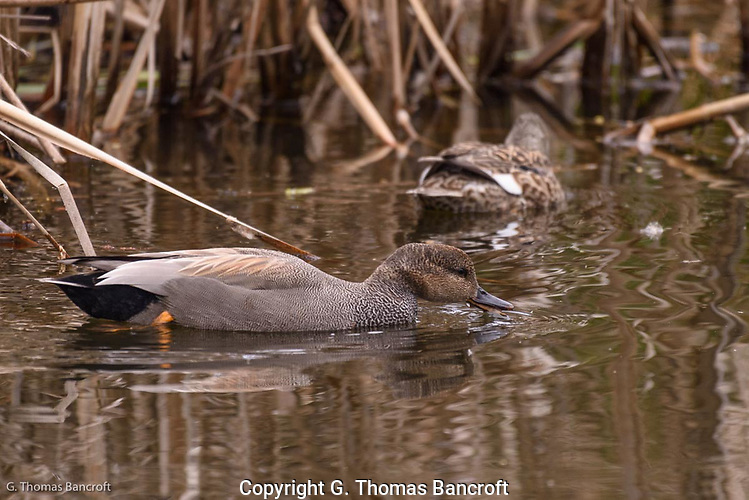 They had only just arrived in the Puget Sound basin, and this one had chosen Stillwater for its breeding territory. He was busy defending this space as well as looking for a prospective mate. 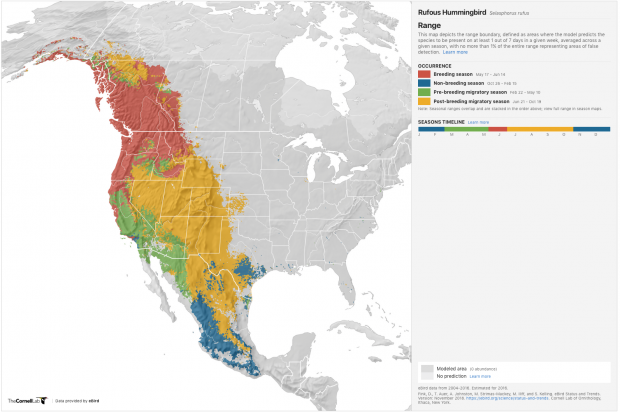 The range of the Rufous Hummingbird determined by modeling eBird data. Cornell Laboratory of Ornithology. Recently, Cornel Laboratory of Ornithology has started to use data collected by birders to understand the distribution and movement patterns of birds throughout the year. The eBird program has been running for more than a decade and now covers the entire globe. Sufficient data have been recorded in North America to allow some fascinating analyses for a few species. Rufous Hummingbirds take a clockwise migration path on their annual trek. In the spring, they head north from Mexico along the western side of Mexico, through California, and into their breeding range. In the summer and fall, they move south through the Rocky Mountains into Texas and southern Mexico. The distribution map Cornell has produced now provides a finer resolution understanding of this species range. Also, Cornell created an animation of this hummingbird’s distribution throughout the year. You can watch these little birds begin their northward travels, settle in for breeding, and then head back south. Imagine, a bird whose weight is only a little heavier than a half teaspoon of table salt can do this monumental loop. Keep birding and keep entering your sightings into eBird. We have much to learn about the natural world and its fascinating inhabitants. 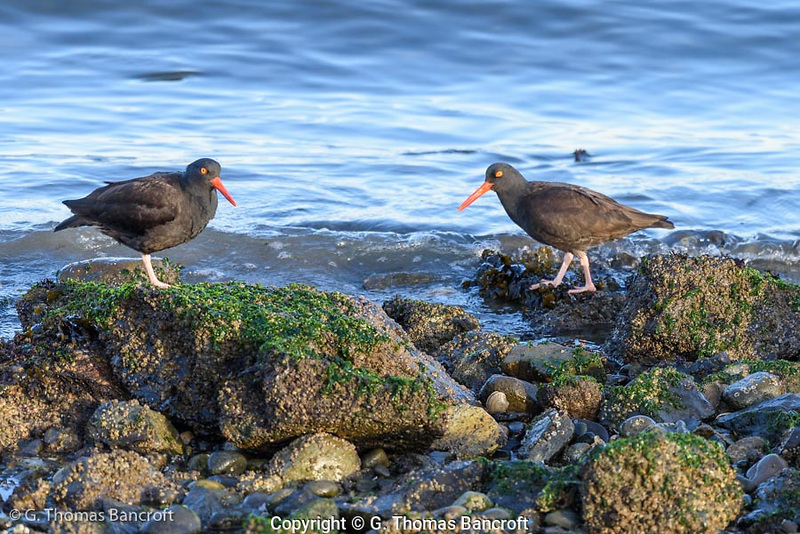 “Oh, look, two Black Oystercatchers are in the rocks,” Craig said. One bird stood on a seaweed-covered rock a foot above the water. The other waded in the shallows; the gentle swash was only coming an inch up its tarsi. My three buddies and I had been scanning Padilla Bay for 20 minutes, watching the Surf Scoters, Common Goldeneyes, and Buffleheads that were feeding offshore. Our three spotting scopes had been straining to find a loon, murrelet, or grebe while right, almost at our feet, were these two black birds that blended into the rubble in spite of their long red bills. The Oystercatchers moseyed toward the right. One stopped to bathe in three inches of water, then flew to a small rock where it started to preen. The other ambled around the edge, probing into the debris but without putting much energy into it. They both seemed to be enjoying the late afternoon sun on this 45-degree February day. Mt. Baker rose in the north above Padilla Bay and had overlooked our journey like a god watching the peasants work. 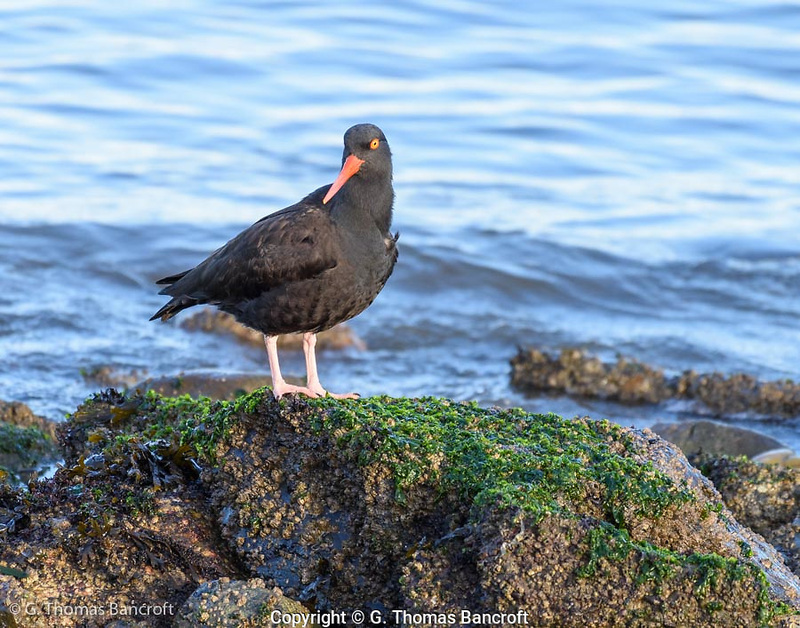 “We should get a picture of the oystercatchers with Mt Baker,” Bruce said. Craig already down on one knee held his phone vertically and was snapping amazing photos. Their red bills glistened while the volcano sparkled in the distance. “Look, there’s Glacier Peak through the gap,” Craig pointed east across the water. 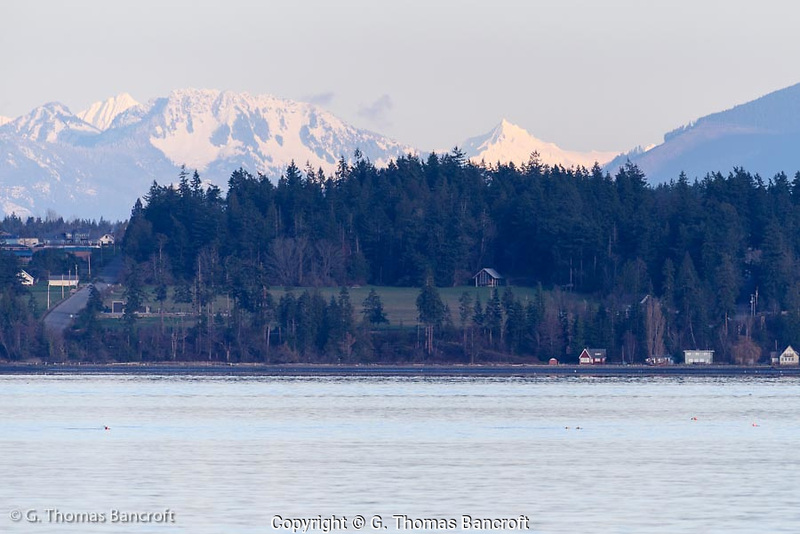 A white pyramid rose above the Douglas firs on the east side of Padilla Bay. 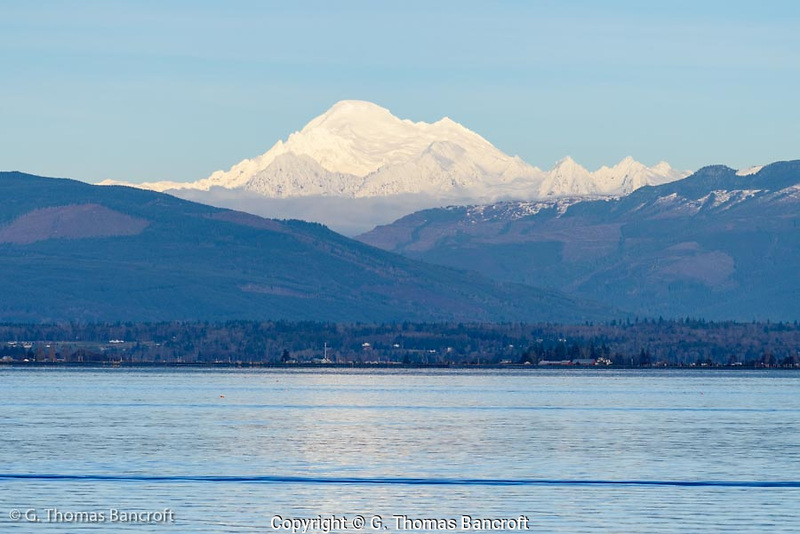 “The Peak is way back and only visible in a few places.” We had been discussing all the snow-covered peaks on this cloudless day; my friends knew them while I was working on learning their names. 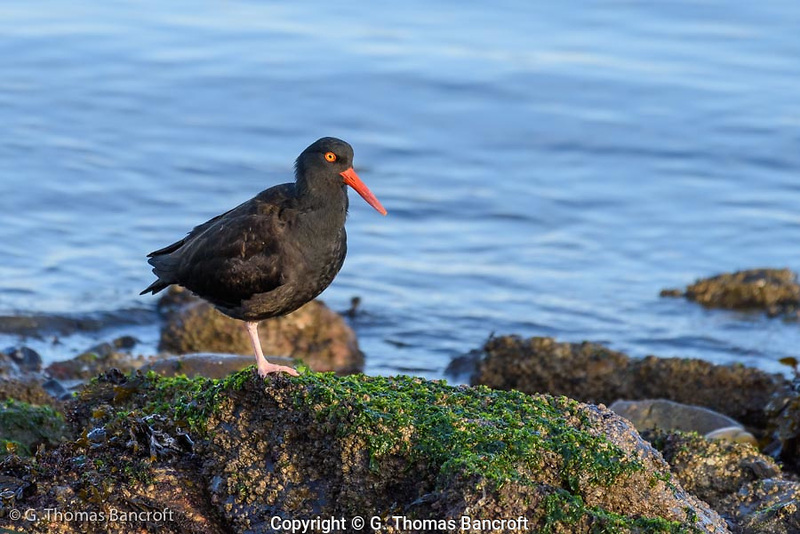 Our gaze returned to the Oystercatchers who had drifted another dozen yards down the surf’s edge. “Let’s stop at one more place around the point before we head back,” I said. Bruce, Gordie, and I had left Seattle early this morning and birded the Stillaguamish Flats before heading north to meet Craig on Fir Island. Identifying fifty bird species had warmed our souls on this chilly winter day. 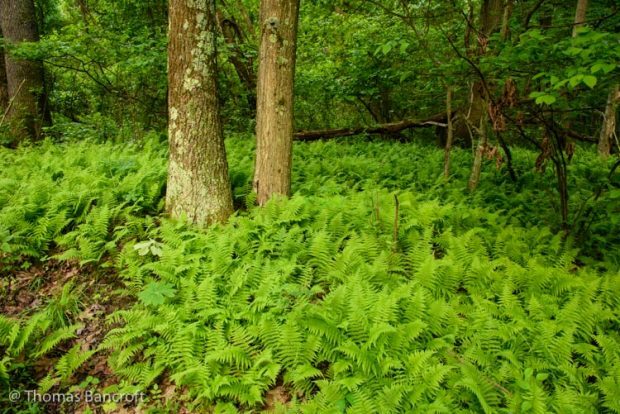 The eastern deciduous forest in Western Pennsylvania is full of bird songs in the spring. The morning fog filled the landscape with a sweet damp smell and dawn had only just started. It was late May in Western Pennsylvania. The eastern deciduous forest surrounded me. A few hemlocks grew on some north-facing slopes, but mostly oaks, cherries and maples dominated the landscape. The gurgling sounds of the stream filled the atmosphere and contributed to the sublime feeling. I had just rounded a corner when I heard the first morning notes of a Wood Thrush. The flute-like whistle resonated through the forest and immediately a second and then a third began to sing. I stopped my walk to listen and imagined this cinnamon bird with a streaked breast sitting a dozen feet up in a tree proclaiming its territory. Since moving to Seattle, I’ve missed hearing this bird in spring and summer. When I lived in Maryland, I looked forward to its return in late May. One would sing from the oaks just up the street from my house, and I’d listen from my backyard. We often call migratory birds like the Wood Thrush that breed in the United States “our birds,” but is that the right characterization when they spend most of the year farther south. Wood Thrushes winter from southern Mexico south through Panama, spending at least as much time there as they do on the breeding grounds. In 2009, I was invited to do a Christmas Bird Count in Costa Rica and arrived late at night before the count day. The next morning, we met at 4 AM to begin our search. The first bird we detected was the “pit-pit” call of a Wood Thrush. 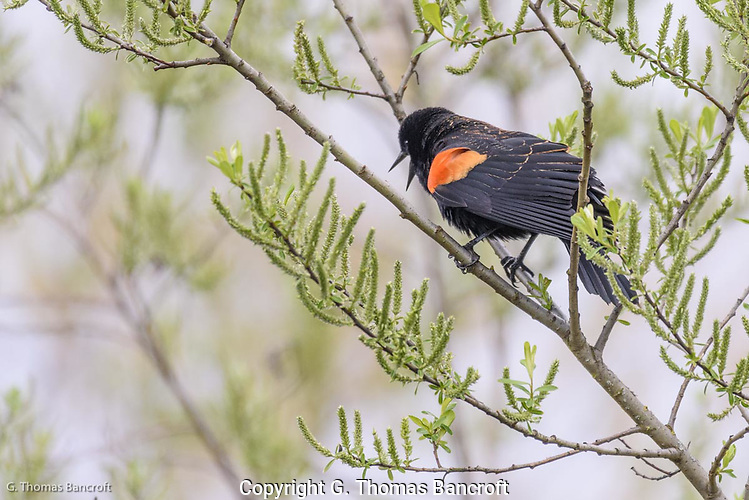 Later when talking with folks, I thanked them for sharing “their bird” with us in the United States and told them about the thrill I had each spring on hearing them sing. Although populations of Wood Thrushes are still strong across the northeast, their numbers have decreased by more than 60% since 1966. They are now listed as a species of “Continental Concern” in the 2016 State of North American Birds’ Watch List. Other birds, including chickadees, titmouse, cardinals, and Carolina wrens began to join the wood thrushes in morning melody. I closed my eyes to take in the beautiful sounds before continuing my walk. The quaking aspens glowed in the soft light. The dawn sky was just starting to lighten as I snuck into the quaking aspen grove, trying not to make a sound, to sit and listen to the day’s first chorus of birds. About a mile up the Umtanum Creek from the Yakima River, the tumbling water in the stream and the wind in the aspens were the only sounds present. The hot, dry air had the smell of fresh hay and reminded me of summers on our Pennsylvania farm. The sun wouldn’t rise for another 50 minutes as I settled, leaning against the smooth bark of a young aspen tree to listen and wait. About ten minutes later, the first squawk happened, and it came from the far side of the grove, too far for me to record the sound well. A yellow-breasted chat had begun its morning song, a mixture of whistles, cackles, screeches, mews, caw notes, chuckles, rattles, gurgles, and pops. Expecting a mixture of bird songs including Lazuli buntings, black-headed grosbeaks, Bewick’s wrens, spotted towhees and maybe some warblers or vireos in addition to the chat, I patiently waited. 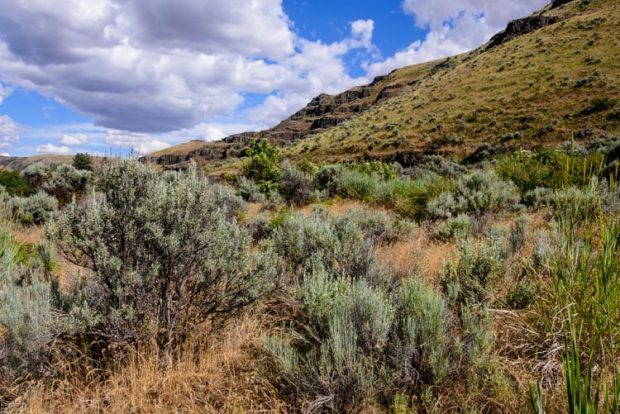 The habitat in Umtanum Creek Valley was a mixture of sagebrush, riparian areas, and aspen groves. The wind rustled the leaves and the air was fresh and dry. After a quarter hour, a bunting sang far in the distance, but nothing other than the chat was nearby. 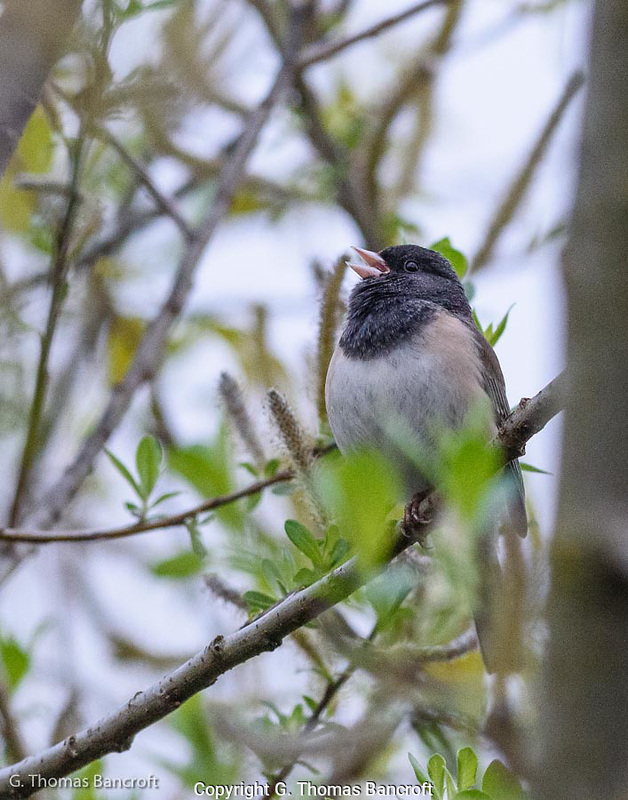 Maybe at that point in early June, all the birds were incubating eggs or caring for young and not that interested in advertising their presences, so I climbed to my feet to walk around the aspen grove and approach the singing chat. The yellow-breasted chat was on the backside of a large elderberry bush that sat up against the aspen grove, and he was hidden from my view. His song was loud though, raucous and full of variability. 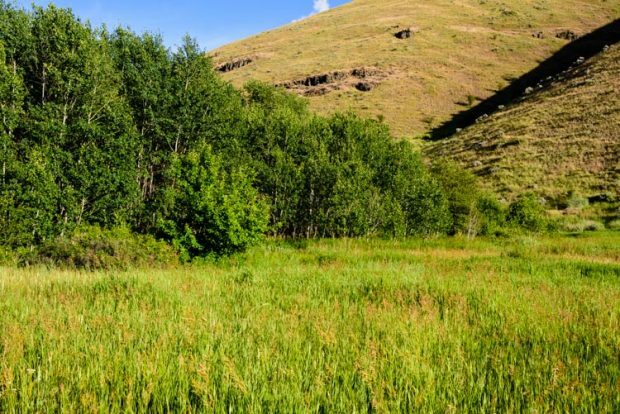 Standing in chest high grass, I listened to hear when he repeated individual songs, but I lacked the experience to recognize so many different notes, whistles, and screeches. A song would radiate out from the bush; then a pause happened before the next one jumped out. He reminded me of a person who liked to hear himself talk non-stop; not listening to what anyone else had to say. An hour later, he was still singing and had not made an appearance above the bush. I left to hike up the valley and look for other things in this wild country. 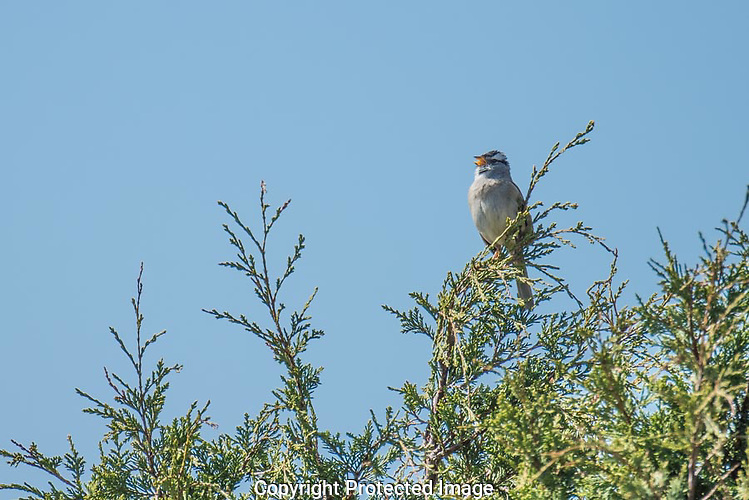 Dr. Donald Kroodsma, an expert on bird songs, once answered a question about how he learned so much about songs by saying he listens with his eyes. Here is sonogram movie of 10 minutes of this yellow-breasted chat’s singing. His calls are shown by intense red, and where the sonogram becomes almost white, it is showing the loudest notes. Individual calls, songs, and screeches range from 1,500 kilohertz to almost 15,000 kilohertz. Note the variability of his calls and how he mixes them up in a random order. This chat may be responding to other chats in the distance, or he may simply be singing what he wants. A lazuli bunting and an American goldfinch can be heard in the background and appear on the sonogram. A clear sweet high pitch whistle came through the air. It sounded a little like a whine that moved into a gurgle and then to a chirp. The soft sound began again after a short pause. The sun was out and the air cool as I walked along the dike at Wylie Slough in Skagit County. 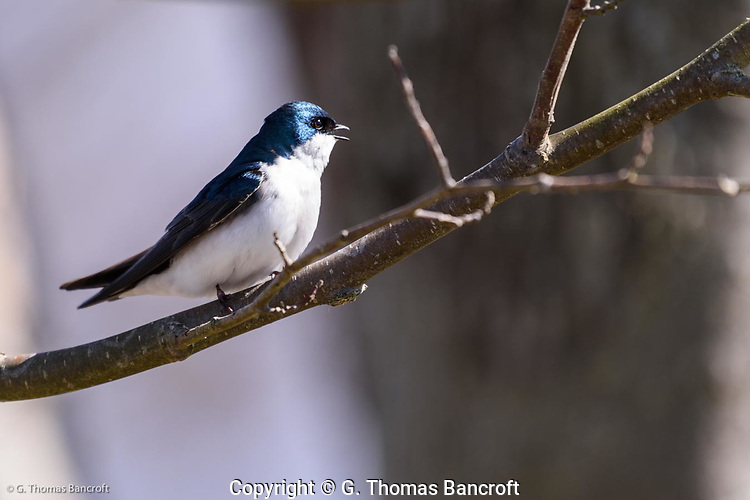 It was only the third week of March, and I was surprised to hear the song of a Tree Swallow at this time in Washington. I scanned the branches for this small insectivores bird. They call from a perch near a possible nesting cavity. An iridescent green streak shot from a branch, its long pointed wings propelling the bird forward. The swallow began to do acrobatic twists and turns as it attempted to catch insects on the wing. 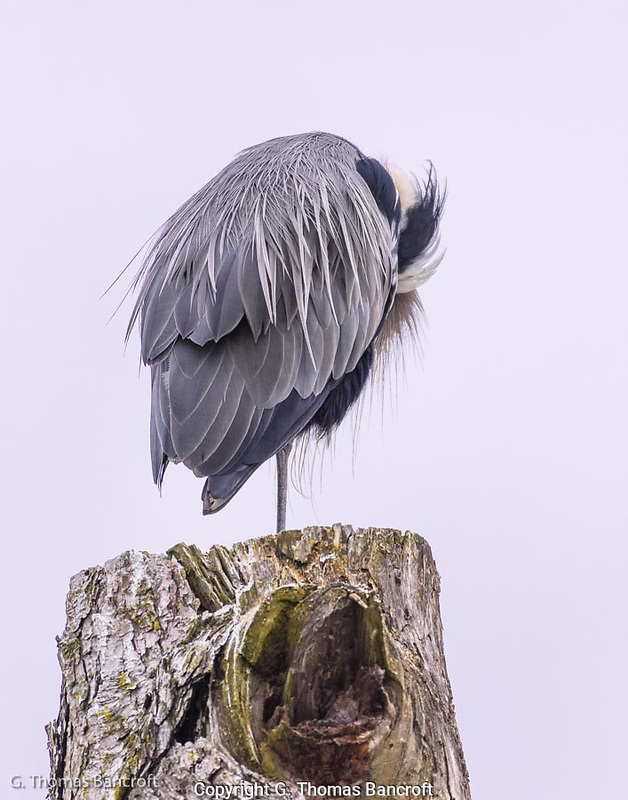 The bird flew out over the marsh, only a few feet above the brown vegetation, looped around a dead tree that rose out of the shallow water, twisting to the right and out of sight. Wylie Slough is near the outlet of a Skagit River branch. 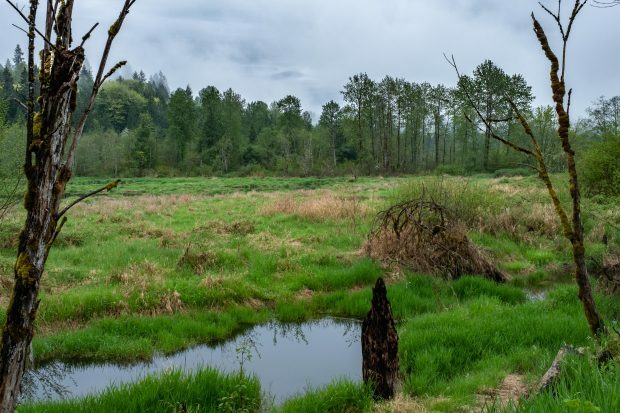 A few years ago, this area was restored to tidal wetlands, removing dikes that had allowed part of it to be farmed, reestablishing tidal flow, and creating habitat for salmon and wetland birds. The dike runs several miles through this wetland and provides excellent viewing of the restoring wetlands. 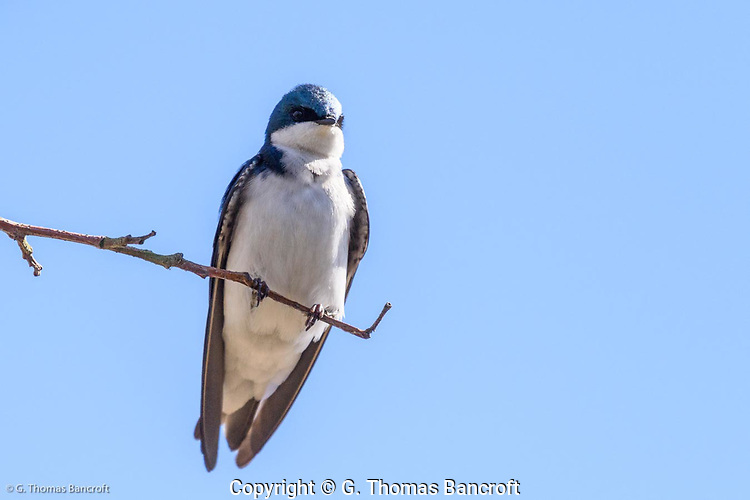 The tree swallow flew in past my head, only a dozen feet away, and landed on a dead branch, looking away from me. 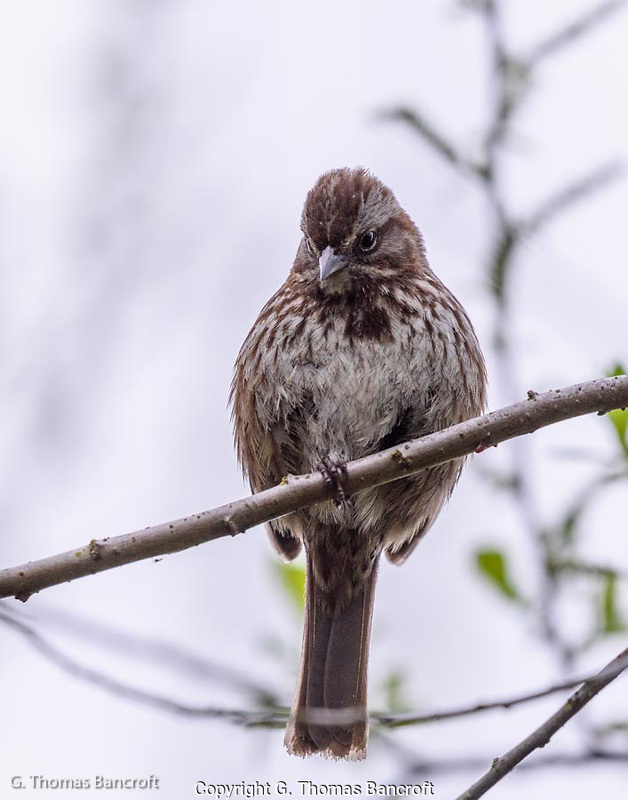 The bird began to preen its feathers, twisting its head to grab individual feathers with its delicate bill and pull them through, straightening the barbules, making sure the feather functioned properly. The swallow crunched its neck in contortions to preen feathers along its back. A second bird alighted just inches from the first and began to sing softly, a mated pair. A small wooden bird box was attached to the trunk of a red alder 10 feet off the ground. The pair had appropriated this location for a future nest. Several woodpecker holes were in the dead trees, and this pair could choose to use one of them. I left the pair resting on the branch and continued down the dike. A nesting box hung from another tree at eye level, and I stopped to watch if this one had a prospecting pair. Two minutes later, a swallow swooped low over the open water beyond the tree, twisting a few times, before flying onto a knot above the box. It sat, staring down at me, bending its head to the side as if it wasn’t sure what I was. The bird stayed only a second before dashing off in the opposite direction, but in less than a minute it returned, quickly followed by a second one. One bird flew down from the perch to hang on the side of the box, sticking its head in and out of the hole, but never fully entering the cavity, before it flew out on a foraging trip. 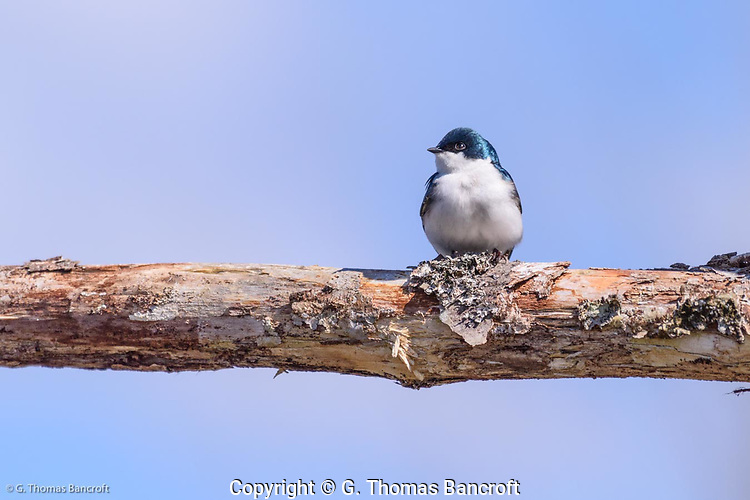 Over the next week or so, many more tree swallows will return to this wetland. 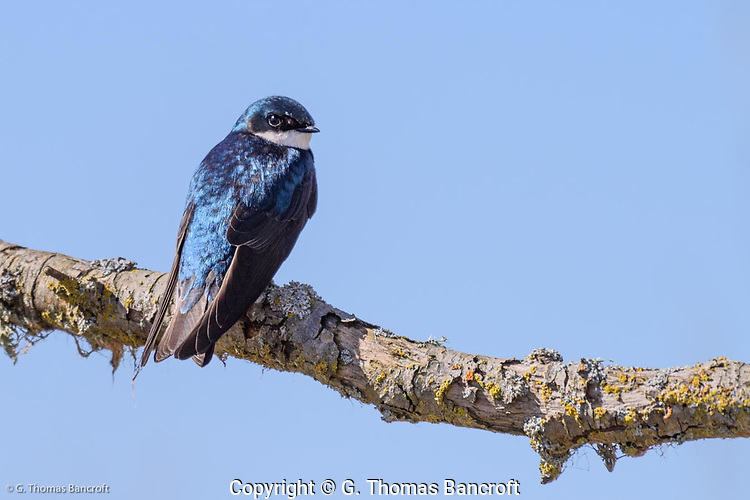 The abundant dead trees in the recently flooded fields should be full of woodpecker holes and would provide many places for swallows to nest. 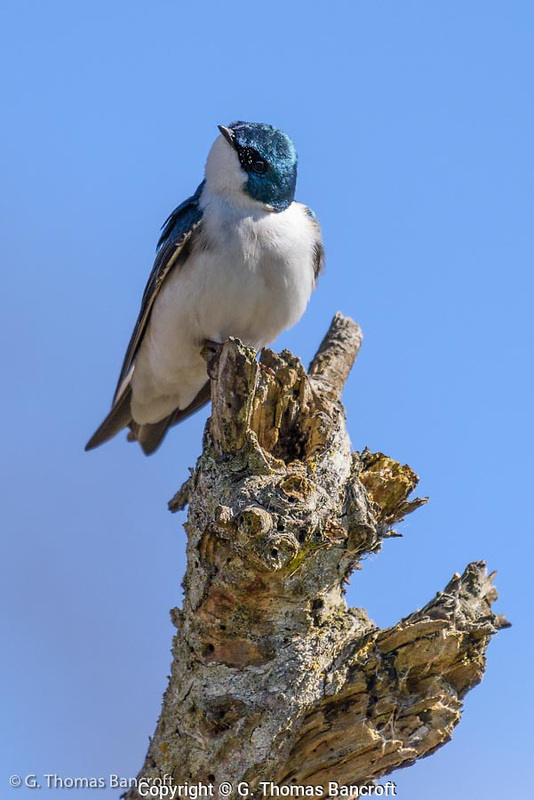 If sites are available, tree swallows will nest in dense numbers, just defending the cavity and a small space around it. I stopped to listen to a bird give its high pitch song, thinking that spring is rapidly progressing in Washington. In two days, it will be the spring equinox. The cacophony was loud even with all the windows closed in my car, so I opened them to take in the cackle. The car filled with honks, guffaws, and the fresh sweet damp air of a sunny day in late March. I parked quickly and jogged to the post and rail fence that bordered the dirt road. 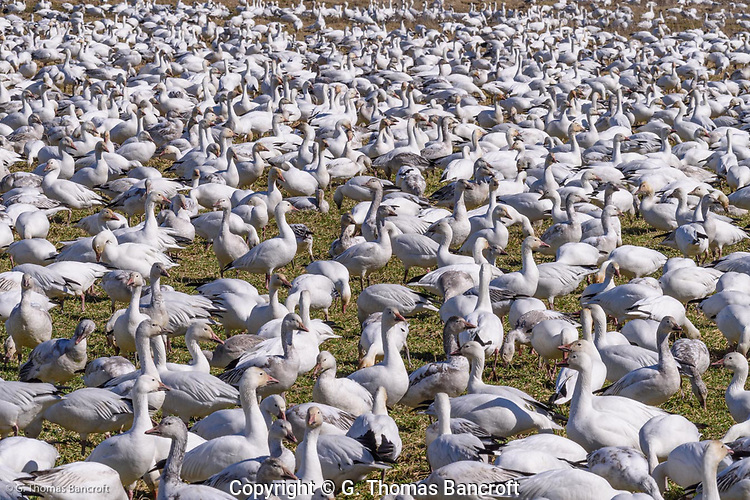 Beginning just 50 feet beyond the barrier stretched ten acres of moving, bobbing, and honking white; 5,000 or more snow geese covered the wet field like a quilt. A hundred people leaned against the fence, watching this mass of birds jockeying to be in the right place. 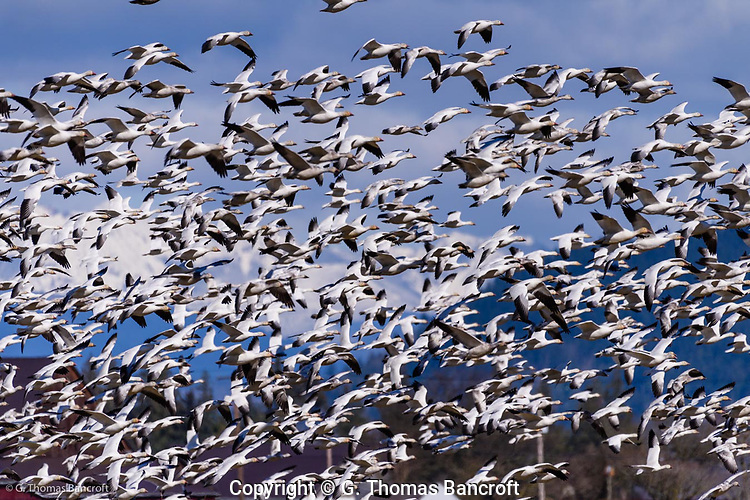 The geese were like a swarm of humans covering a high school football field after the homecoming game. 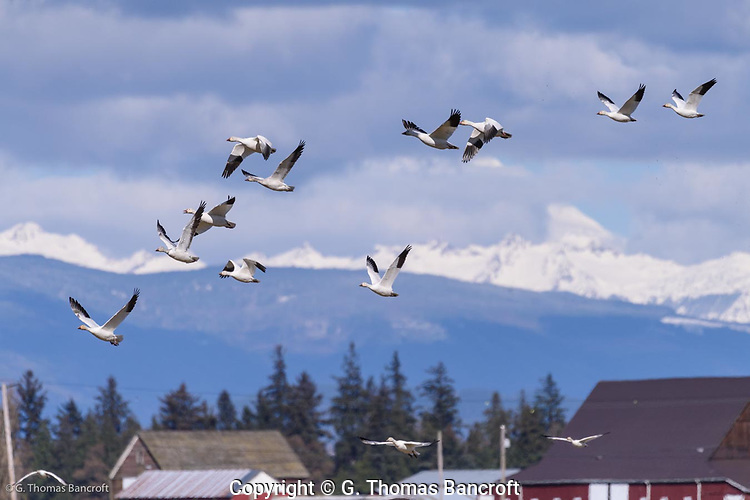 Large numbers of snow geese winter in Washington’s Skagit County, and I had come to see if any were still here. 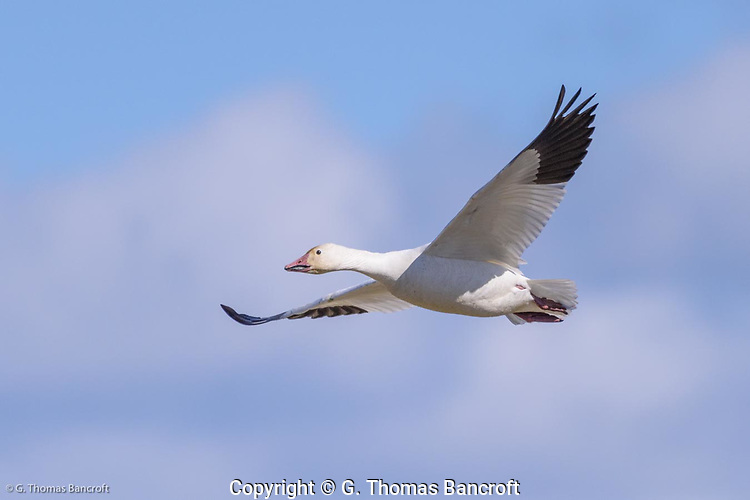 By late March, they could have started for their nesting areas on the Arctic Coastal Plain of Alaska. 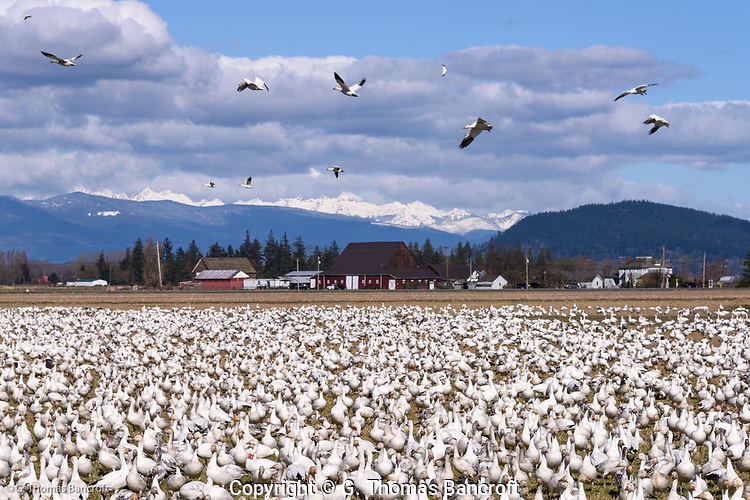 These geese roam the Skagit Flats throughout the winter, grazing on grass, sedges, and willows, or eating leftover potatoes or spilled grain, or digging up tubers and roots. This flock stretched for several hundred yards back into the field and at least 400 yards wide. Individual birds standing on the ground were mostly white, their black outer wing feathers being covered by body feathers. 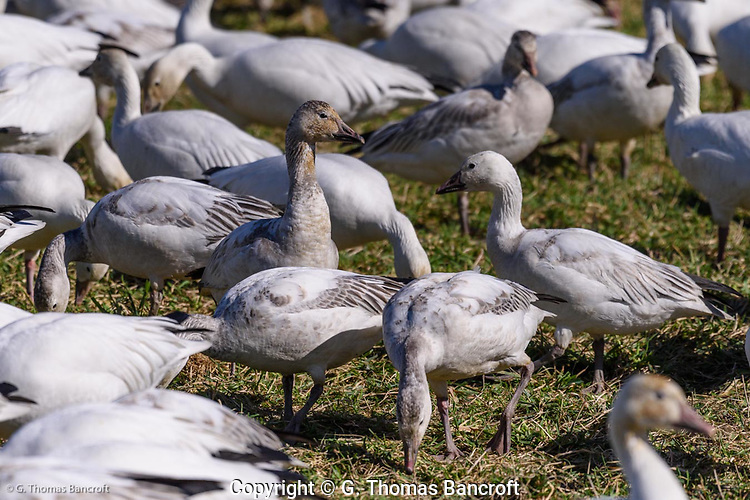 Their pink bills and dark eyes gave contrast to the white body feathers. Many still had a little light brown on some feathers; these were young hatched last summer. 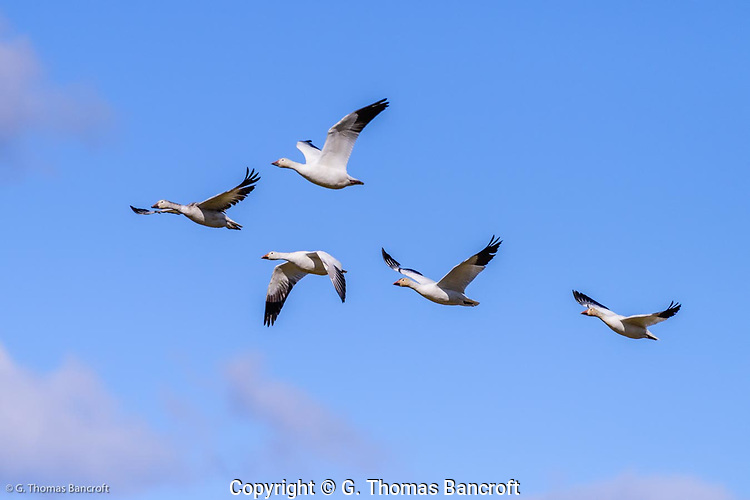 Small to large groups came in from the east to land with the expanding feeding frenzy, and these flying individuals showed the distinctive black wing tips and white bodies as they approached on fixed wings. Families stay together throughout the winter and talk to each other incessantly as they feed or fly. It is like a clan of humans at a theme park, chattering to each other about what the see, where they are, and where to next. Really, it is about staying together in a crowd. This chatter carried across the field, filling the air with babble like at a noisy crowd at a fair. 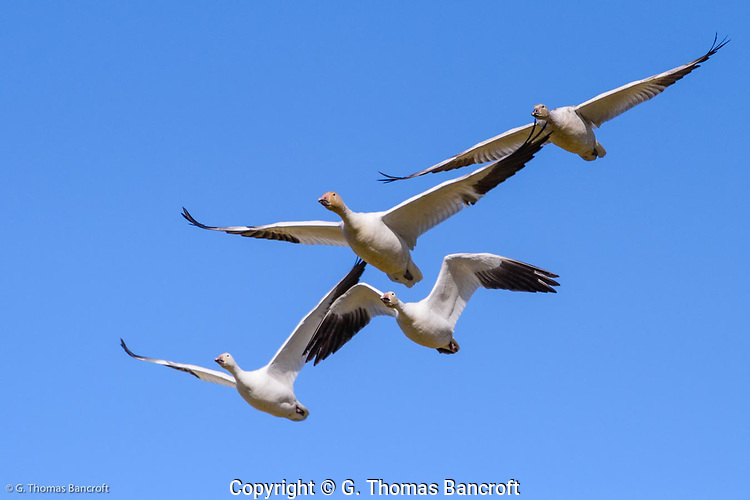 Groups of two to five would decide to move locations and rise on strong wing beats to 20 to 50 feet above the ground, flying swiftly over the flock before deciding on another place to land. Each then fixes its wings, beginning a gradual glide toward the field, finally holding its wings almost vertically to create strong drag, alighting with a gentle step. Displaced geese were chattering back at the new arrivals, trying to hold onto their piece of the dinner table. Some started to leave this field and head west to another. Groups of two to fifty birds would rise and fly west over my head and out of sight. 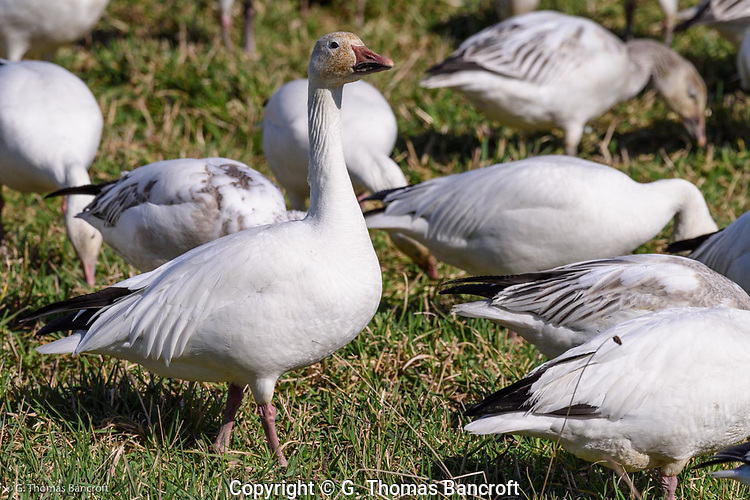 Single individuals would come back to fly around the field, relentlessly honking, probably looking for their missing family group. Glacier peak rose above the Cascades to the southeast and the birds that passed in front of this distant volcano looked picturesque against the white covered peak. To the northeast, low hanging clouds mostly covered Mt. Baker but flying flocks with the distant cloud draped mountains reminded me of landscape watercolors in the Smithsonian Museum. 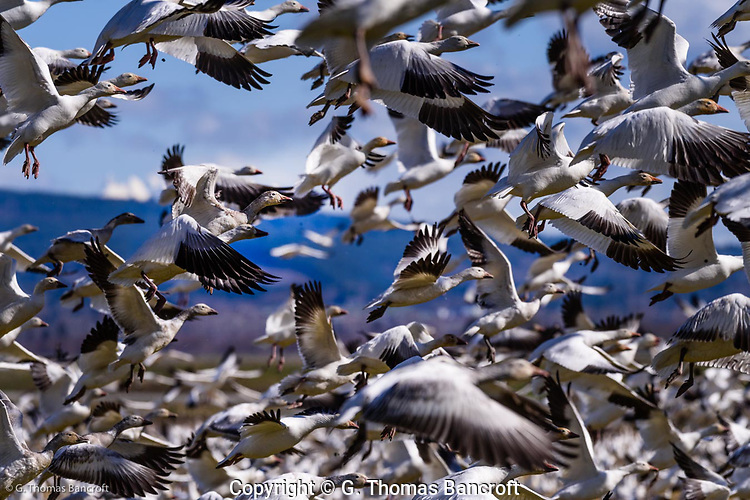 In a roar of wings and honks, three-quarters of the birds rose into the air at once, thousands jockeying for position, gaining altitude and attempting to stay with their families. I could sense the massive exertion of their breast muscles contracting to pull their open wings down quickly and give them lift. The power of these sprinters oozing across the field as the mass rose at a steep angle into the air made me feel taller and stronger. Those in front of me started south before they turned to fly directly overhead, creating a moving shadow across me. I crooked my neck to watch the white mass pass, wondering how they avoided crashing into each other in the turmoil. The honking made it impossible to hear myself think. The commotion lasted only a few minutes, but the energy filled the air for a long time after the birds had disappeared to the west. A thousand birds still feeding a hundred yards across the field seemed like an anticlimax to the spectacle. I watched for another 20 minutes as individual geese flew back and forth between the two feeding locations looking for lost comrades. The cacophony had dissipated, but the sweet smell of spring remained. The glaucous-winged gull came flying straight toward the boat. It’s wings fixed in a steady glide into the wind. The bird’s speed and the wind created enough lift to allow the bird to close the hundred yards to me without once flapping its wings. The bird was going to fly directly over our boat, and I would be able to look right up at this marvelous example of flight. Have you every wished that you could fly? When I was young, I dreamed about what it would be like to soar like the red-tailed hawk that flew above our farm fields or to fly like a barn swallow low over the hayfield twisting and turning to catch insects. This gull, so aerodynamic, glided right toward me. Envy seemed to be surging through my veins. As the bird approached, I almost felt weightless and imagined extending my arms to join it as it passed. My body tensed and my heart sped up as I stared at this perfect example of aerodynamics. This bird’s feathers create a streamlined body, and its skeleton has been modified to be light but sturdy. Most bird bones are hollow, filled with air, and yet can support the torque created by muscle contraction and the pressures of flight. Large breast muscles attached to their sternum provide the power to flap their wings, and their well-developed cardiovascular system can pump large amounts of oxygenated blood to these muscles. They can sustain vigorous activity for long periods of flying, but this gull seemed to glide effortlessly. Holding my arm in front of me, I marveled at how a bird’s wing is a modified version of my primitive vertebrate forelimb. Bird wings have a humerus, ulna, and radius. The digits are reduced to three, and some bones in the hand are fused together. The primaries — outer flight feathers — attach to the hand bones, and the secondaries attach to the ulna. These flight feathers provide the power for flight. The downward movement of the wing creates lift as well as thrust forward. The upper surface of the wing bends up, creating a convex surface and a longer distance for air to travel than it does across the bottom of the wing. Consequently, the air moves faster over the wing’s top, reducing air pressure, and creating lift. “Wow. Look at that, amazing”, came from the crowd around me on the boat. I had just missed seeing an orca breach. The gull, however, passed directly over me, and I turned to watch it continue past our boat. I smiled wondering how many of my whale-watching colleagues thought about the wonders of flight. What is it about a tree anyways? 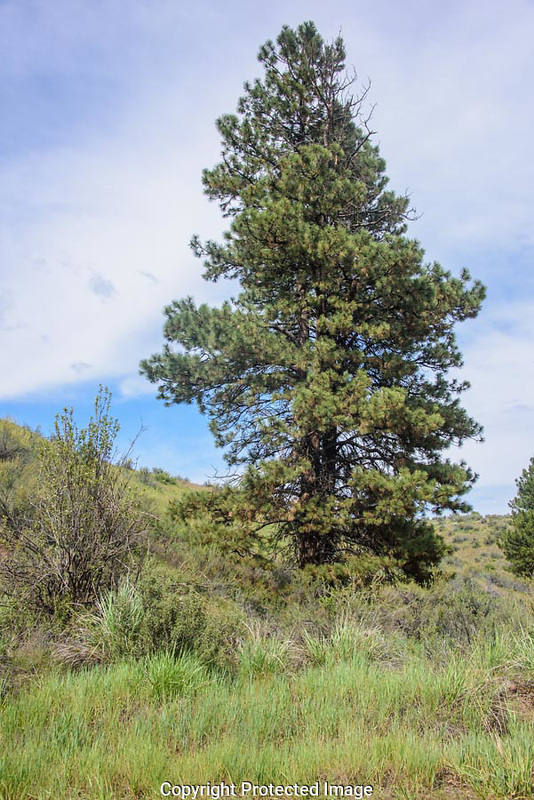 I was bumping and jostling along North Wenas Road, a dusty dirt road with lots of potholes when I saw a silvery flash near the top of a lone Ponderosa pine. The pine sat in a sea of sagebrush and grasses, a towering dark green monolith in the expanse of short brownish green. I pulled over to scan the tree with binoculars and see what might have made the flash. As I raised my binoculars to my eyes, a Lewis’s woodpecker flew out from the tree making a broad circle over the road and back into the tree. The whole time it was squawking. It landed by a second woodpecker and I could see the two of them flashing their wings as they greeted each other. Courtship! It must be spring. Within seconds of seeing this, a red-shafted flicker began its boisterous call. At first, I thought maybe the Lewis’s woodpecker could call just like a flicker but the flicker kept calling over the next few minutes. Eventually, the flicker popped out on a dead branch near the top of the tree so I could confirm that it was a flicker and not the woodpecker imitating it. While all this was going on, a bullock’s oriole made a brief appearance near the top left side of the tree. Its yellow feathers glistened in the afternoon sun and I could see it looking back and forth into the foliage at the top: a nice male with its black back feathers and black eye stripe. After just a second or two, it dove back into the dark green foliage. I heard the gruff scratchy notes of the oriole as it hopped through the foliage. A European starling sat on one of the dead branches along the left side of the tree and began to give its screech call. At first it startled me, for I didn’t think this was quite the right habitat for a starling, but sure enough it was sitting in this ponderosa pine. As I watched this menagerie, I realized that both an American robin and a house wren sang in the background. I couldn’t tell if they too were in the tree, but they definitely were part of this meeting place. A pair of red-tailed hawks came over the crest of the hill behind the pine and began to circle lazily on the thermals rising from the sagebrush expanse. They too called a few times. You can listen to this meeting place in the backcountry outside of Ellensburg. As I sat listening, I realized I could also hear crickets calling too. The tree reminded me of a coffee shop where so many people come to meet, often oblivious to others who have come to meet too. I smiled and tipped my hat to this old ponderosa pine and its important role as gathering place. I wonder how many decades it has served this function in these rolling hills. I would love to hear if you have seen a tree function in a similar way for wild things?